In January 2018, Eurocircle was given responsibility for managing a Europe Direct Information Centre (EDIC), whose office has been open since June. Europe Direct provides a free service available to all European citizens, in order to respond to their questions regarding the European Union; how it works, its finances and its actions. There are over 500 EDIC centres throughout Europe, with 47 in France. 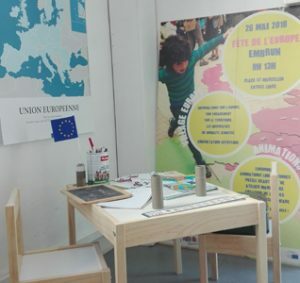 The team, Stéphanie (France), Florian (France), Anastasia (Greece) and Jack (UK) are always happy to welcome members of the public and respond to any questions about the European Union. 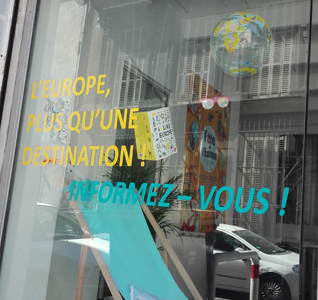 The centre will significantly boost the current European presence in Marseille, also the location of the European Commission Regional Office, by creating a welcoming and informal space for people of all ages in which to broaden their knowledge of the European Union. The team also very much hopes to collaborate with other EDICs throughout Europe in order to encourage both a sense of Europe citizenship and democratic participation in the European Parliamentary elections in May 2019. While the office is operational, works are still underway in the large rear room, which will eventually host meetings, cultural events and other activities. The centre will be officially opened on 20 September, and the team looks forward to welcoming Eurocircle’s partners and other distinguished guests to that event. 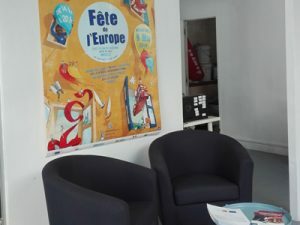 The Centre is located on the ground floor, 47 Rue du Coq, Marseille, open Monday-Friday 9am-12.30pm, 2pm-5.30pm.